As WHC membership has increased, so too have the challenges of connecting a widespread member base with the decision-making Board of Directors. In order to overcome some of those challenges the state was split into 5 Districts, each of which has its own set of member-elected officers and up to 2 member-elected representatives that it sends to the Board. These "District Directors" are the voice of the District within the Board. Districts hold meetings and events which typically follow a monthly schedule. Although most meetings may be of the conventional sit-down type, there might also be speakers, seminars, demos or such. Trail ride/camping meetings are popular as well. Decisions about District meetings are entirely member-driven, so it is really up to you, the members, to participate and decide what you want to do. The counties that make up each District are listed below, and the District Map is located in the center column of most pages of this website. You can click on your District on the map to take you directly to the listing of current meetings and information about that District. Ashland, Barron, Bayfield, Burnett, Chippewa, Douglas, Dunn, Eau Claire, Iron, Pepin, Pierce, Polk, Price, Rusk, Sawyer, St. Croix, Taylor and Washburn counties. Florence, Forest, Langlade, Lincoln, Marathon, Marinette, Menominee, Oconto, Oneida, Shawano and Vilas counties. 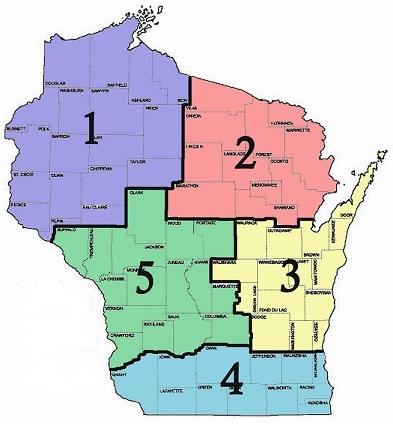 Brown, Calumet, Dodge, Door, Fond du Lac, Green Lake, Kewaunee, Manitowoc, Outagamie, Ozaukee, Sheboygan, Washington, Waupaca, Waushara and Winnebago counties. Dane, Grant, Green, Iowa, Jefferson, Kenosha, Lafayette, Milwaukee, Racine, Rock, Walworth and Waukesha counties. Adams, Buffalo, Clark, Columbia, Crawford, Jackson, Juneau, La Crosse, Marquette, Monroe, Portage, Richland, Sauk, Trempealeau, Vernon and Wood counties.